This is the first joint venture project of presidential candidate, Senator Manny Villar and popular host of top noontime show "WOWOWEE', in the Philippines, Mr. Willie Revillame. WIL TOWER MALL is a project of Vista Land Vertical (Vista Residences). Located just accross the ABS-CBN compound along Eugenio Lopez Drive in Quezon City, Wil Tower Mall is the home of a whole new, exciting world of fun, fame and entertainment. Inquire now to reserve a unit. Only Php25,000.00 to reserve. Get Php100,000.00 discount if you reserve now. Get ready for star living at its finest. 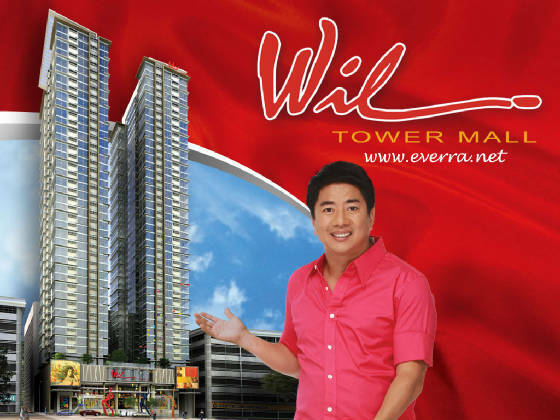 Introducing Wil Tower Mall by Willie Revillame, where high living meets the good life at this two tower, 38-storey inner city, mixed -use condominium development along Eugenio Lopez Drive in Quezon City. sitting on 3,000 sqm, the development has 4 levels of commercial spaces and 4 levels of basement parking. Located across ABS-CBN, the Wil Tower Mall is home to a new world of fun, fame and adventure. Accessible to the city's premier business hubs, schools, and universities like Ateneo de Manila, Miriam College, UP Diliman hospitals like St. Lukes Center and Cardinal Santos Medical Center; shopping and entertainment centers like SM North EDSA, Trinoma, Gateway Mall and the Araneta Center. Back to EVERRA REAL ESTATE. Copying any part of this website is strictly prohibited.